Marine aviation squadrons Corps units are salvaging aircraft parts from museums aircraft in order an attempt to keep active planes flying and paying for paper towels out of their own pockets to keep their offices clean, according to anecdotes from a key congressional leader. And lawmakers are livid about the fiscal shortfalls, even if their budget infighting is partly to blame. During a recent trip to several sSouthern U.S. military bases, Marines told House Armed Services Committee Chairman Mac Thornberry, R-Texas, that they've been paying for their units' supplies like pens and paper towels, and were forced to raid decommissioned aircraft for parts. "I have heard firsthand from service members who have looked me in the eye and told of trying to cannibalize parts from a museum aircraft … getting aircraft that were sent to the boneyard in Arizona back and ready to fly missions, pilots flying well below the minimum number of hours required for minimal proficiency," Thornberry said. And lLawmakers are livid about the fiscal shortfalls, even if their budget infighting in Congress is partly to blame. At issue are military readiness accounts stretched thin by more than a decade 14-plus years of war and four years of defense penny pinching. Earlier this month, chiefs from each of the four services told lawmakers representatives that those two stressors have led lead to belt-tightening headaches for units across the military, in some cases deferring long-term needs in favor of short-term solutions. But those statements have generally be vague warnings. Last week, House Armed Services Committee Chairman Mac Thornberry, R-Texas, offered specific anecdotes he heard during a recent trip to a series of southern U.S. Marine Corps bases, including the museum raid. "I have heard firsthand from service members who have looked me in the eye and told of trying to cannibalize parts from a museum aircraft … getting aircraft that were sent to the boneyard in Arizona back and ready to fly missions, pilots flying well below the minimum number of hours required for minimal proficiency," he said. Thornberry would not identify which Marine air station base had the parts shortage, and Marine Corps officials at the locations he visited would not confirm the stories. 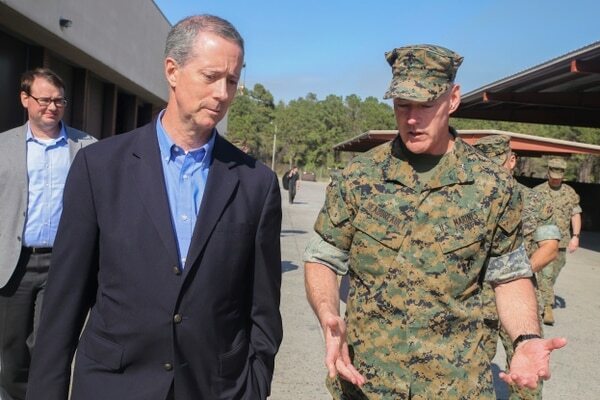 Rep. Mac Thornberry, left, speaks with Maj. Gen. Brian Beaudreault, the commanding general of 2nd Marine Division, at Camp Lejeune, N.C., March 18. But Joint Chiefs Chairman Gen. Joseph Dunford, confronted with the anecdotes at a March 22 hearing, did not dispute and seemed to confirm the incidents when confronted with the anecdotes at a March 22 hearing. "What you saw in the Marine Corps I think reflects in some part what you'll see in all the services, perhaps not to the same degree as Marine Aaviation," he told the chairman. "But that same dynamic exists in each one of the services." The Marine Corps has about 180 F/A-18A-Ds, said Marine Corps spokesman Maj. Clark Carpenter. Typically, 43 F/A-18s from deployable squadrons and nine from training squadrons are in depot for maintenance at any given time. That leaves only about 60 percent of the deployable aircraft in flyable, "fight tonight" status." Lt. Gen. Glen Walters, the cCorps’ deputy commandant for programs and resources, told lawmakers earlier this month that budget cuts have left the entire service "under-resourced" for spare parts. The Marine Corps has requested $460 million from Congress in fiscal 2017, some of which would buy spare parts for aircraft, but aviation readiness is not expected to fully recover until at least 2020. 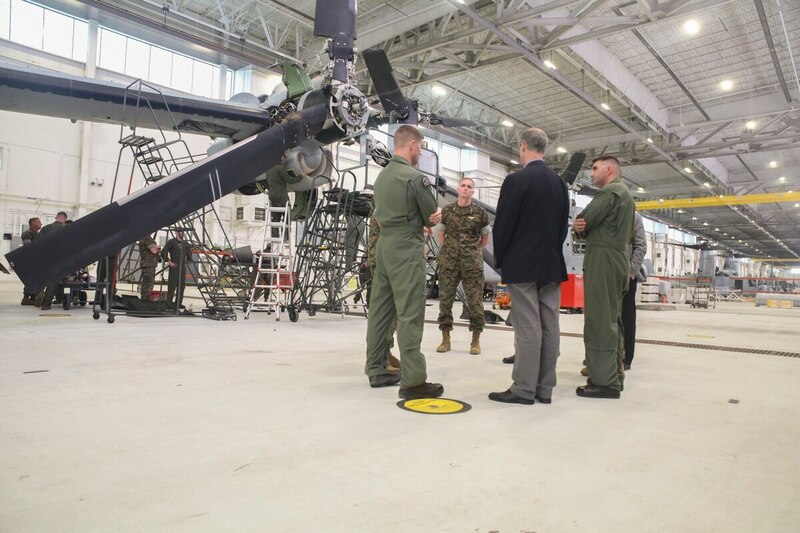 Thornberry said the museum salvage attempt he learned about didn’t work, and the Marines were unit was forced to find another fix to get the aircraft ready for an overseas mission. "The part they took off the museum aircraft did not fit the aircraft they were trying to keep flying," he said. "But they're looking for whatever they can do to keep these things up in the air. It's just amazing." Earlier this month, Marine Corps Commandant Gen. Robert Neller blamed some of the lost equipment maintenance and repair woes on the continued high tempo of operations. "The fight in ISIL continues to put stress on equipment, particularly aviation," he told lawmakers, using an acronym for the Islamic State group. "We're in the process of resetting our equipment and then you're trying to maintain legacy gear, and at the same time modernize every model type series of aircraft." Other service officials have echoed similar problems. Dunford and Defense Secretary Ash Carter point to Congress' defense spending caps, which have limited maintenance and investment accounts in recent years, and begged for relief in upcoming budgets. But committee members have questioned the Pentagon leaders' assessments that the White House's fiscal 2017 budget request is truly enough to fix the deep-seated problems, criticizing their promises that next year's spending caps will be enough to right the force. Thornberry said that several service members have told him they've started buying "basic supplies" like pens and cleaning products "because otherwise it would take three to four months to get them if they could get them at all." "I'd say my concern level was very high when I hear [anecdotes] like that. You have folks out there doing their job and they can't get a pen from the federal government procurement system. "It just makes you think 'my gosh, can't we do better than this?'" Reporter Jeff Schogol contributed to this story.